Pankraz Weidner. Courtesy of Die St. Mariengemeinde zu Buffalo Grove, Illinois via Raupp Memorial Museum, Buffalo Grove, Illinois. [S11] John J. Weidner, Compiled Birth, Death, 567, 601, 683, 595, 664, 666. [S874] Pankratz Weidner, State of Illinois; Department of Public Health - Division of Vital Statistics; Standard Certificate of Death. 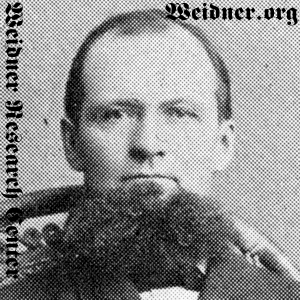 [S11] John J. Weidner, Compiled Birth, Death, 683, birth year and German state only. [S534] 05 Jul 1860 1860 U. S. Census, Arlington Heights, Cook County, Illinois, USA, Wheeling Township, page 151, dwelling 1059, family 1020, 1860 census states he is 14 years old and born in Hanover. [S874] Pankratz Weidner, State of Illinois; Department of Public Health - Division of Vital Statistics; Standard Certificate of Death, Birth date, country. [S902] Jacob Weidner, Bark Clementine Microfilm, 02 Sep 1851, The ship passenger manifest indicates he was five years old at the time of the voyage suggesting he was born in 1846, 104. [S195] Palatine Enterprise, 28 Sep 1923, p. 5, col. 4, Death date, son's house, city. [S465] Cook County Herald, 21 Mar 1924, p. 6, col. 2, Wife's obituary states he died 9 September 1923. [S874] Pankratz Weidner, State of Illinois; Department of Public Health - Division of Vital Statistics; Standard Certificate of Death, Death date, township, county, state. Buffalo Grove is scratched out with a line. [S195] Palatine Enterprise, 28 Sep 1923, p. 5, col. 4, date and location. [S874] Pankratz Weidner, State of Illinois; Department of Public Health - Division of Vital Statistics; Standard Certificate of Death, burial date, city and state. [S781] Cook County Herald, 11 May 1906, p. 1, col. 3.